$4 Discount on Delicious Caramel Fondue Was: $23.99, Now: $19.99! Get Upto 25% Discount on Sephra Belgian Dark Chocolate 4 lb Box & 20 lb Case. No Coupon Required. 10% Off - New Sephra Imported Belgian White Chocolate - 4lb Use Coupon: EZSAVE11. Independence Day Sale - Get $7 Off on Sephra Belgian Dark Semi-Sweet Chocolate 4 lb Box – Only $32.99! Sephra provides the highest quality Chocolate Fountains for home use world wide. Sephra chocolate fountains are known for being whisper quiet and delivering a beautiful cascade of chocolate every time. Sephra's chocolate is made by the world's finest chocolate manufacturers. 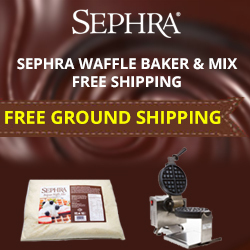 Being made in the USA this ready-made special sephra’s proprietary chocolate fountain recipe is rich, smooth and delicious contains 34.9% cocoa solids and its ingredients are natural and kosher certified. Sephra.com offers the best quality and eco-friendly commercial chocolate fountains for sale worldwide. Wide Selection of Sephra Chocolate & Fondue including Melano Milk, Melano Dark Semi-Sweet, Melano White Chocolate, Premium Milk Fondue, Premium Dark Semi-Sweet Fondue, Premium White Fondue, Belgian Milk Fondue and Belgian Dark Semi-Sweet Fondue Chocolate. Sephra also offers other entertainment goods for home use and catering specialists such as Chocolate fountain accessories, eight types of fondue chocolates, Belgian chocolate mousse mixes and delicious creme brulee. Candy making is a lot of fun when you have the right tools, molds, and chocolate. Here is everything you need to create fun candy molded chocolates for your events and weddings. Indulge yourself with our chocolate fountains, gourmet chocolates and more! Shop now for all new Sephra Belgian dark chocolate and milk chocolate packages including 1600 bamboo skewers is a perfect choice for any event. Also get free ground shipping! Found a coupon for Sephra?